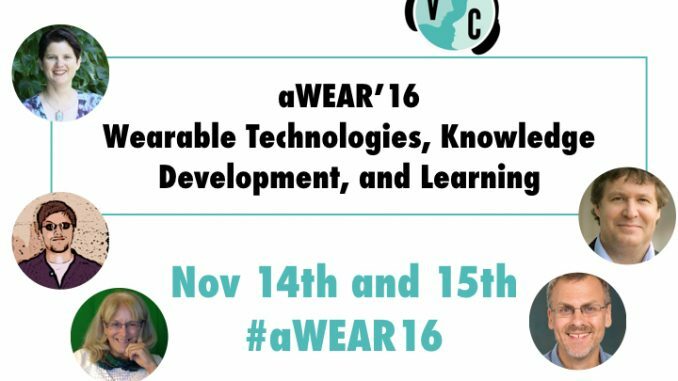 We’re excited to participate in the #aWEAR’16 conference to talk about wearable technologies, knowledge development and learning. Virtually Connecting will share two conversations from the aWEAR’16 conference being held at Stanford University on November 14th and 15th. Thanks to generous support, co-director of Virtually Connecting, Rebecca J. Hogue will be onsite and connecting virtually. Virtual buddies Apostolos Koutropoulos (AK), Maha Bali and Helen DeWaard will welcome virtual participants into these live events. We will kickstart by connecting with Rick Voithofer. Connecting from onsite will be Rebecca Hogue and Matt Crosslin. The virtual buddy is Helen DeWaard. If you cannot join into this live event, it will be live streamed and recorded on YouTube (embedded below). Meet onsite guest George Siemens. Connecting from onsite will be Rebecca Hogue and Matt Crosslin. The virtual buddies will be Apostolos Koutropoulos (AK) and Maha Bali. You are invited to participate – add a comment to this blog or send out a tweet to one of the virtual buddies or onsite hosts.